Live Creating Yourself. : To paint or not to paint? That is the question. So it's been decided my roommate and I will be resigning our lease. Translation: the odds of me tiring of the black gallery wall in my office are good to very good. What are your thoughts on switching out the dark, bold neutral for a fun, fresh minty green color like this Kate Spade pop-up store? Vote now! Go for the mint! I painted a couple pieces in my apartment (since I couldn't paint the walls) a minty green. It's a fresh, bright pop of color! i voted for the mint! but i also think that mint is very trendy right now and you may or may not be painting it again in a few years. :) but i think mountainview will be delicious looking! I have a wall in our home that's painted with that exact Behr color.. I love it! 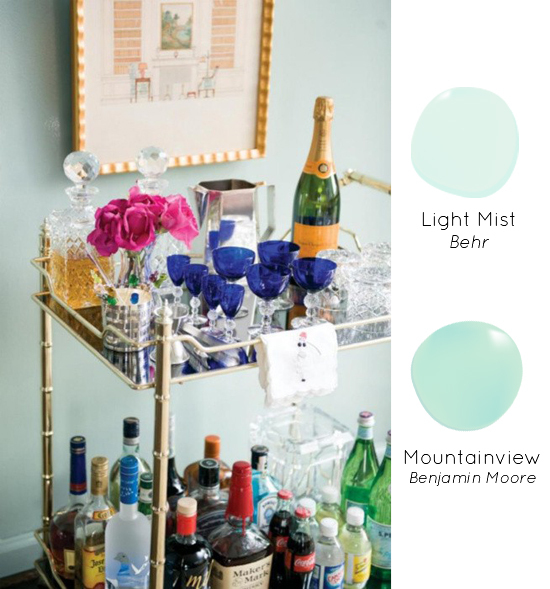 I say go for the mint- loving that shade right now! Love! You know I've wanted to paint my place for forever. Just didn't want to deal with painting & having to paint over the paint once I move. I never get tired of black and white! Keep it!!! i love the black, but i can't stop looking at the minty green of kate spade. love both looks!!! We just painted our bedroom minty green! It's so pretty and soothing! I love the minty green idea but I think black is so striking - I vote keep it black! 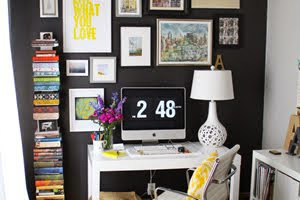 I painted a wall in my spare bedroom black all because of your office! I love the black!! 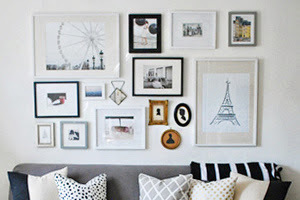 I adore the black wall but I totally get you wanting a fresh look. Go minty! Mint is awesome.. loving it. But I vote keep! The black is perfect in that space! 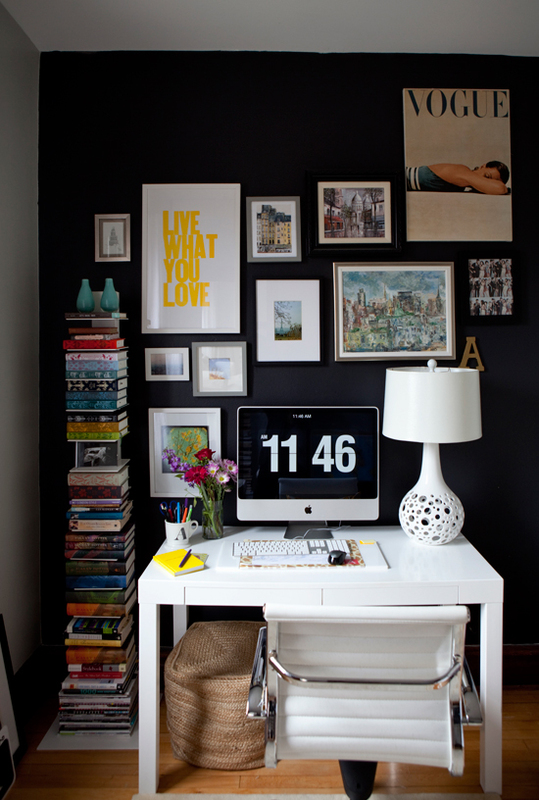 The black wall is such a great statement but I think the mint would be so fresh, a fresh change I think. Hi! I just recently discovered your wonderful blog. I too have been considering a minty green color. Check out Micheal Penny's home tour on Canadian House & Home. He used F&B Pale Powder in his living room and F&B Teresa's Green in his den. 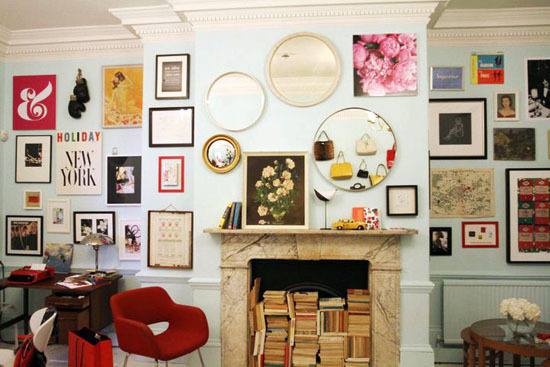 Lovely home tour! I love the minty green - it's very fresh. Maybe even something like a light blueish/gray could work? Definitely something to brighten the space. Can't hurt to try! I have mint green in my entryway and I looove it! Argh! I've been considering repainting my kids' shared bedroom a minty color, away from a mustard color. This is not helping me resist! And yes, go for the repaint. You can always paint it back to black, right?